Uganda is one of the largest refugee-hosting countries in the world. With few resources to offer to more than one million displaced people, Uganda represents a case study for generous refugee-hosting policies.The following article was published in the January-February 2019 issue of NewsNotes. Uganda is a nation with a long history of refugee movement that deserves consideration. In the early 1960s, the newly-independent east African nation received thousands of refugees from both Rwanda and Sudan, confining them to designated camps. In 1971, hundreds of thousands of Ugandans fled the horror of the government of Idi Amin into Sudan. In the late 1980s fighting in Sudan caused Ugandans to return home and Sudanese to follow them. The 1994 genocide in Rwanda resulted in over 200,000 refugees entering Uganda. In 1999, Uganda participated in the UN Self Reliance Strategy for refugees which allocated land to refugees in relocation settlements and offered them free access to health and educational services. Initially they were provided food, with amounts declining over time. The goal was to encourage refugees to become as self-sufficient as possible while restricting their movement. It wasn’t until the Refugee Act was passed in 2006 that refugees could work and move freely throughout the country. By 2017, Uganda had received one million refugees from South Sudan alone. Refugees from the Democratic Republic of the Congo and Burundi brought the total to 1.4 million. How can a country with a 2018 estimated population of 45 million people cope with such an influx of refugees? Uganda agreed to implement the framework in January 2018 and developed a Refugee and Host Population Empowerment Strategy. Refugees are integrated into development by settlement policies that are supported by loans from the World Bank. The aim is to transition from emergency measures and incorporate host populations in the process. The ‘30-70 Principle’ requires that 30 percent of refugee interventions target host community needs. All of this was developed by the current National Resistance Movement (NRM) government of Uganda, resulting in a mainly top down approach. However, all of these government policies could not have come into existence without the active, welcoming attitude of the host populations. Many Ugandans in the north remember the welcome they received when they left their homes for Sudan and were freely given refuge. Stories are told of Ugandans sharing their land and hiring refugees with needed skills for building and other services. These people truly see one another as brothers and sisters when confronted with immediate needs that demand compassion. 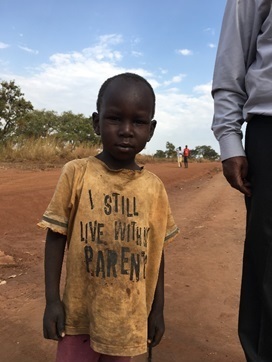 But the northern Ugandans bear the largest brunt of the current influx of refugees. Often their land is appropriated without compensation and the forests are being denuded. As numbers increase the need increases and resources are stretched very thinly. People are human and certainly become frustrated by long lines at the water pumps and jealous of food rations, seeds and school supplies that bypass them on the way to refugees. The NRM has ruled for 32 years and seeks to be seen as a leader in promoting progressive policies for refugees. Their record for accepting refugees, as compared to countries with larger resources, is truly impressive. However, reports from the ground suggest that some funds from international agencies disappear into government bank accounts and NGOs reserve employment for Ugandan nationals. 1. International actors need to deliver on promises of significant financial support. 2. The Ugandan refugee crisis needs a more robust discussion about durable solutions or it will drag on. 3. Refugees and local communities must be consulted in a more meaningful, systematic way. 4. Rigorous policy making is required to better attune to the daily needs of the refugees as they unfold. Uganda’s historical experience can be a foundational model for providing basic human needs in times of crisis. Other nations confronted with massive migration would be wise to learn from them if they have respect for human rights and any compassion at all. 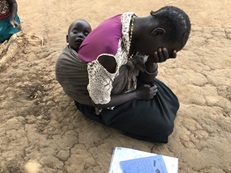 Image: A young South Sudanese refugee girl, shown in front of a mud and thatched house called a tukul, carries a small child, probably a sibling, in traditional fashion on her back at the Palabek Refugee Settlement in Uganda. Photo courtesy of Maryknoll Magazine.